Para subir reputación con la Venganza de la Garfa, lo primero es "activarla". Para activarla, tendremos que conseguir una de las Monturas Falcosaurio. Una vez tengamos una en nuestro poder, simplemente tendremos que ir a la zona de Aviana en las Cascadas Nemorosas, en Monte Alto. Junto a aviana, montaremos sobre la montura falcosaurio e invocamos a la mascota falcosaurio de la misma familia.. Ya solo nos quedará "hablar" con aviana. Al terminar la conversación, recibiremos los 500 primeros puntos de reputación y la garfa de marfil. Subiremos reputación al matar a otros jugadores mientras nuestro personaje esta bajo los efectos de la garfa. The requirement for the dialogue to get Garfa de marfil is to be mounted on your falcosaur mount when you talk to Aviana. For anyone who hasn't already completed Cría de la Garfa for Vientos esmeralda or simply does not remember where she is located in Highmountain, you can find Aviana at 32, 66 - just west of the Sylvan Falls flight path. Bringing this to exalted is quite easy. NPCs in Alterac Valley reward Marca de la presa/mark-of-prey. You can easily get 40-60 from clearing out one mine (6k - 8k rep). Killing harpys in Icefang cavern is also good. My record is 122 marks from one Av this way, I never saw an enemy player. UPDATE: This was hotfixed and no longer works. When you unlock this faction, you will be able to purchase http://www.wowhead.com/item=142361. landing the killing blow on an enemy target will reward you with one Marca de la presa/mark-of-prey and debuff the target with a 10 minute debuff (Perseguido). In this time, the target does not reward additional Marca de la presa/mark-of-prey. This means you need to get 90 KBs in PvP WQ areas to get to honored. At honored, you get Pluma de marfil, which can be used in BGs and tremendously speeds up the process. As a reputation farmer i've been considering farming the rep for quite a while now. I read all comments saying how "hard" it is to grind etc...Try farming during the world quests Operación Liberación de múrlocs and Pelea a pelo i got from 200/6000 friendly to 0/12000 honored in 2 hours when the first quest was up. Of course I'm trying not to die, meaning i don't jump on healers, tanks or any players with health >=4.5M health. Also, if you are realm hopping you have to leave the party before killing the party members otherwise you won't get any marks. I'm grinding it as fury warrior with Jarabe de almas. During the Los escombros de Torre Oscura if you have Voluntad ardiente de Kil'jaeden you can try to snipe players from above (my best aim killed 3 players at once), aim it at a large clump of players and drop it on the player with the most health. Keep in mind that it takes a few seconds for the orb to reach the target and if the target dies before the orb reaches its destination it's pretty much a fail. 1. The BEST way to farm marks is doing Pelea a pelo and Operación Liberación de múrlocs. Just fly around and jump on clumps of fighting players. Always focus the target with the most HP, while AOEing the ones on low hp. I thought I would compile some information on the Venganza de la Garfa and methods pertaining to reputation grinding. Venganza de la Garfa is a "hidden" faction, with no associated Achievement or Feat of Strength, and no permanent Titles. The one reason to grind reputation with this faction is for the Halcón zancudo de marfil mount, available at Exalted reputation. This mount is essentially a less armored version of the Halcón zancudo blanco presto which drops from Kael'thas Caminante del Sol in Bancal del Magister (a Burning Crusade dungeon) on Heroic difficulty. To access this faction, first you must complete one of the four questlines granted by your falcosaur pets - Prole de Picoterrible, Prole de Contemplasangre, Prole de Garfafilada, or Prole de Plumanívea. Only one of the questlines must be completed to gain access to Venganza de la Garfa, but it is likely you will want to complete all four questlines anyway as they each grant a mount on completion. After having completed a questline and obtaining the mount, you must summon said mount in front of Aviana at in Monte Alto. For those without coordinates, she can be found at Sylvan Falls, due east and across the water from the Sylvan Falls flight point (northwest of Riverbend on the map). Once you have summoned your mount and spoken to Aviana, she will have a number of dialogue prompts that you must click through. After you have selected "I will be the talons of vengeance", you unlock access to the Venganza de la Garfa Quartermaster - Abalorio, a raven that is sitting on the large statue of the archer near Aviana. After this point, you will have continued access to Abalorio, regardless of what mount you use thereafter or what reputation you are with the faction. DOES NOT share a cooldown with Poción de sanación antigua or Healthstone. DOES share a cooldown with all combat potions (Poción de poder prolongado, Poción de la vieja guerra, etc. ), Poción de maná antigua, and Poción de rejuvenecimiento antigua. The Descansado buff WILL NOT be refreshed if you stand on the nest and already have the buff! You must manually unclick it before standing on the nest to get a fresh 60 minute buff. Descansado DOES NOT persist upon hearthing, even if using Piedra de hogar de Dalaran. Descansado DOES NOT persist on using most portals, such as those available when the Mage Tower Broken Shore building is active. Descansado DOES NOT persist on using Batería de Atraquito/Batería de Atraquito recargable to teleport. Descansado DOES NOT persist on entering any instance (dungeon, raid, battleground, etc). Descansado DOES NOT persist on death. The rested area (for talent changes) and the Descansado buff WILL work on other players, regardless of whether they are in your group or not. Reputation with Venganza de la Garfa is only obtained by farming and using Marca de la presa, which grants 100 reputation per mark. There are a few ways to obtain this item, as outlined below. Note that Marca de la presa is not a currency, and takes up bag space - it stacks to 20. These marks have NO USE after getting to 999/1000 Exalted with Venganza de la Garfa. General strategy: You can only farm Marca de la presa from other players in PvP and Falcosaur World Quest areas up until Honored, at which point you unlock the ability to farm them in Battlegrounds and Ashran. Overall, the grind until Honored was not very enjoyable, as I felt that I was ganking other players (particularly my own faction) who may have been just wanting to quest without bothering anyone or being bothered. There are two items that will allow you to farm Marca de la presa are Garfa de marfil and Pluma de marfil. These are outlined below. Grants Marca de la presa on a successful killing blows on other Level 110 players while the buff is active. A killing blow on a Blood Caballero de la Muerte with the Purgatorio talent will not grant a Marca de la presa. As a result, you can kill players of your own faction for Marca de la presa. Hostile NPCs of the opposite faction (in the Warden Tower Assault areas) become NEUTRAL when you use Garfa de marfil. Successfully obtaining a Marca de la presa from killing a player will apply the Perseguido debuff to the target, preventing anyone from obtaining any more marks from killing that player for the next 10 minutes. WILL stack with Juramento de vigía del fuego, allowing you to obtain both Marca de la presa and Moneda sangrienta simultaneously. Unlike the Garfa de marfil, Pluma de marfil DOES NOT apply a debuff to the target, allowing you to kill them multiple times for Marca de la presa. Chistera de la Luna Negra grants the same buff (i.e. they don't stack with each other) but can be used anywhere. It can only be used while the Darkmoon Faire is active though. A few of the buffs above stack - e.g. El espíritu de compartir + ¡WIII! would grant a total of 20% extra reputation gained. 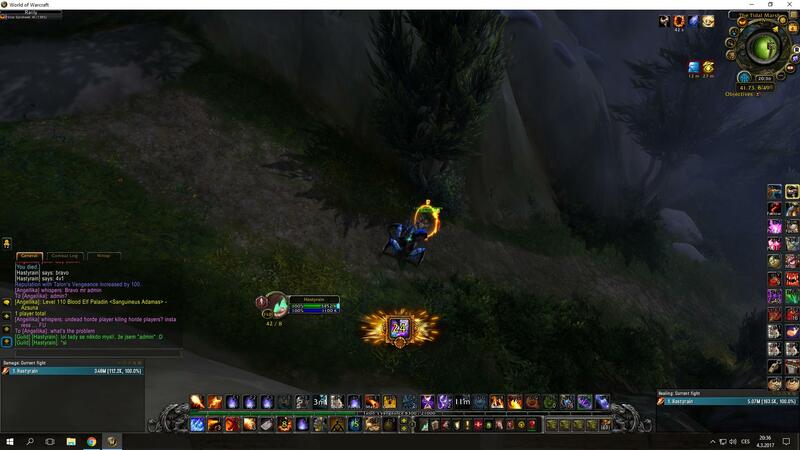 The 20% reputation buff from the garrison Puesto comercial, nivel 3 DOES NOT work, even if you consume the marks in Draenor. It can be worthwhile to save marks in your bank for the Darkmoon Faire, and use them once you can get the ¡WIII! buff. There are two Warden's Tower quest areas in Val'sharah, Monte Alto and Tormenheim. At any given time, one in each of those zones will have a Horde PvP World Quest active, while the other will have an Alliance World Quest. At any one time there is also one of three Free-for-All PvP quests active - Arena Bruloscuro (Monte Alto), Los escombros de Torre Oscura (Val'sharah) or Pelea a pelo (Tormenheim). Doing these quests makes you hostile to all other players anyway, so using Garfa de marfil is not much of a stretch. You can enter any of these World Quest areas and use Garfa de marfil whether or not there is a World Quest active in the area! Obviously, you are unlikely to find other players if there isn't a World Quest up. Even if you have completed a particular PvP World Quest, you are still able to use Garfa de marfil and linger in the area for as long as you want. While in a raid group, you cannot gain credit for any of the Falcosaur or PvP World Quests, but you CAN earn Marca de la presa from kills. In the Pelea a pelo World Quest area, finding the Rare spawn Garfatormenta and mounting it can allow you to rain down destruction from above! The first time you mount this Rare spawn, you get the achievement Despierta al dragón. If you want to camp a particular World Quest area and remain unseen, Sigilador 54 is a great item to use. This item shares a cooldown with all non-healing potions and puts them on cooldown for 10 minutes (including the Sigilador 54 itself). Below are the locations of all of the World Quest areas that the Garfa de marfil can be used. As mentioned above, all Warden Towers are active at any given time - one in each of 3 zones for Horde, and the other for Alliance. Here's a reputation script to show how much Marca de la presa you need to reach the next rank and exalted. To be honest, I don't know the reason behind of this rep grind. To unlock the faction is already a long road, then this half buttocked method. To make it doable, it just should use the method of a long forgotten rep grind, the Argent Dawn: Comisión de El Alba Argenta. No punishment for being casual in pvp, or not playing warlock/mage/priest/hunter. Welp, seems like getting this rep to exalted by using more than one account has been nerfed. Perseguido's timer does not tick down when you're logged off, even if you wait 45 seconds before you /camp. I waited 2 minutes before I logged my alts off after they were killed and that didn't help. I think back to an old WoW motto but I don't want to use the "E" word so I'll just say this: if you read about a cool trick, do it. Don't put it off. Fun will be detected and dealth with accordingly.